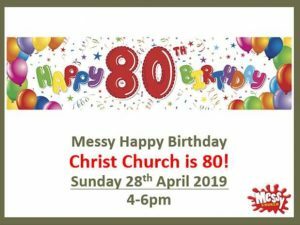 Our Messy Church on Sunday 28th April is from 4-6pm and our theme is ‘Happy Birthday Christ Church Petts Wood’ as we mark the Church’s 80th Birthday. We look forward to you joining us for this special occasion! Join the book club to discuss Rob Bell's What is the Bible? This is held in the home of one of our members and the address will be published in Notes & News. Alternatively message us here for more details. If you can't make this date, why not try our evening book club? Join the book club to discuss Rob Bell's What is the Bible? This is held in the home of one of our members and the address will be published in Notes & News. Alternatively message us here for more details. If you can't make this date, why not try our daytime book club? 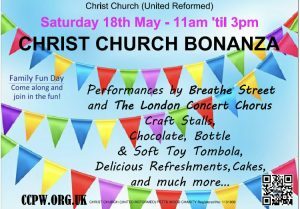 Just a reminder about our Bonanza on Saturday 18th May at 11am! A great day is planned including performances by Breathe Street Dance & The London Concert Chorus, as well as plenty of stalls and refreshments! We look forward to seeing you there! 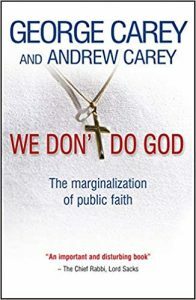 We will be discussing We don't do God by Carey and Carey where the former Archbishop and his son ponder the problems faced by Christians in a secular society. Location will be published in Notes & News, or message us for further details. 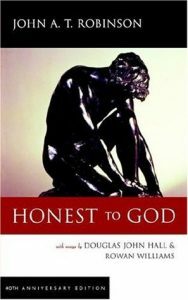 We will be discussing Honest to God by John A T Robinson, a book which created an uproar when published 55 years ago, does it still raise the hackles? Location will be advertised in Notes & News, or please message us for further details. New members always welcome.